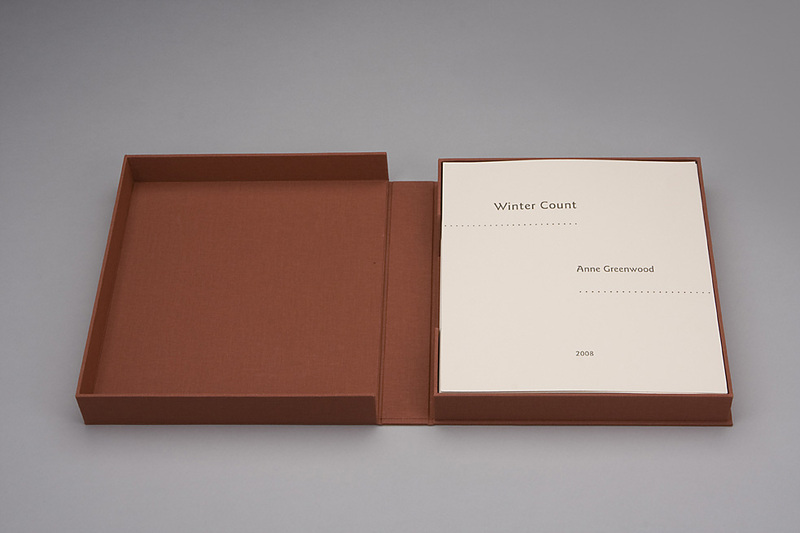 Winter Count: A Forty Year Calendar -portfolio of prints, edition of 25, 2008. 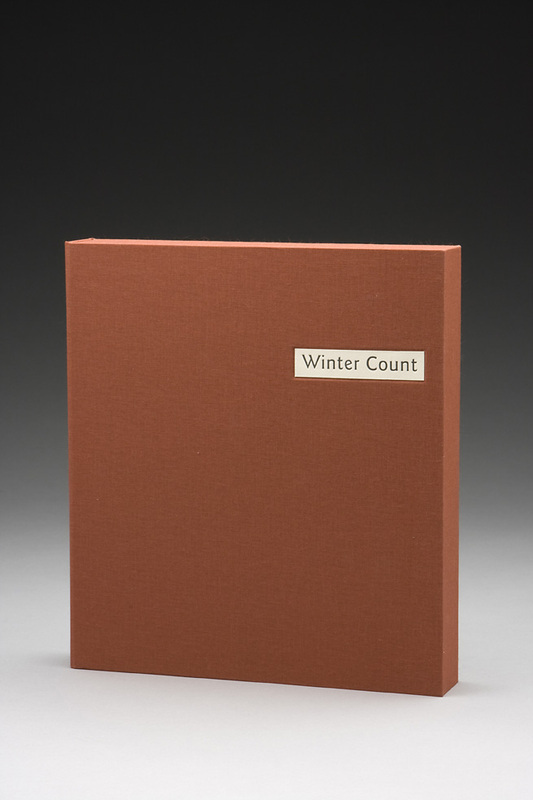 Winter Counts were historic calendars used by the Plains Indians to record time pictographically. 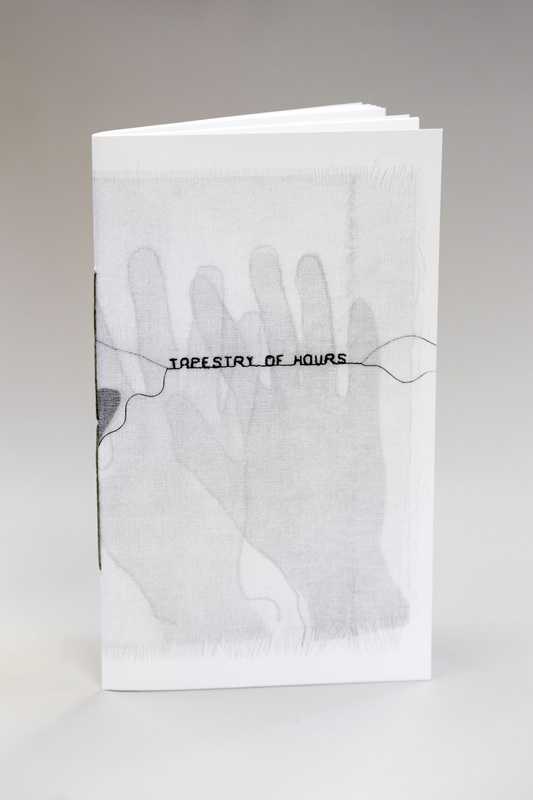 This book is an artist’s interpretation of the Sioux tradition to record a personal history using hand-stitched embroidery and letterpress printing. The embroideries are printed from hand-processed photopolymer plates on a Vandercook Universal III by Inge Bruggeman at Textura Letterpress Printing. 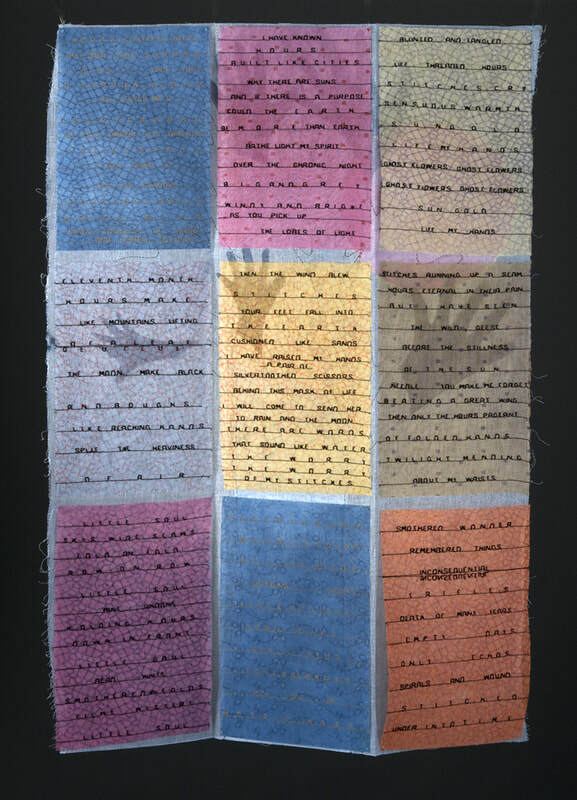 By scanning the pieces of fabric, a unique translation of each embroidery was made into print form. 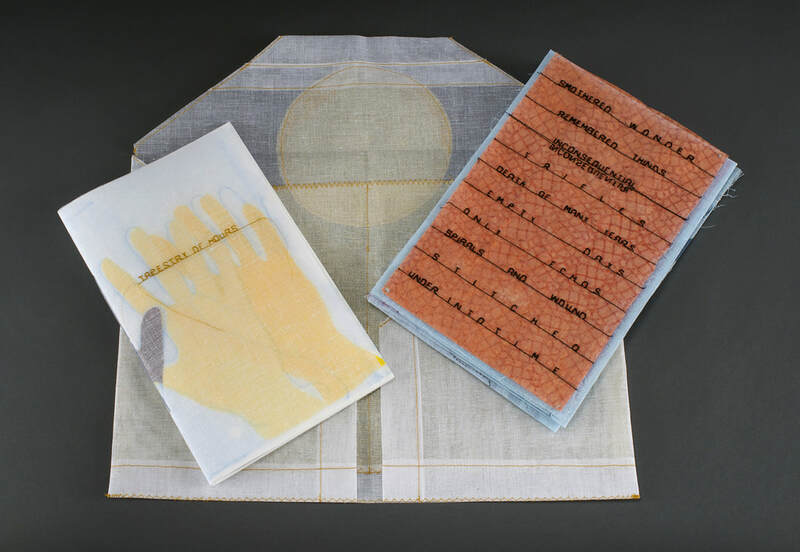 Each image is printed in an edition of thirty copies on Fabriano Rosaspina and each image is printed in a different color, matching the thread in the original sewn imagery. 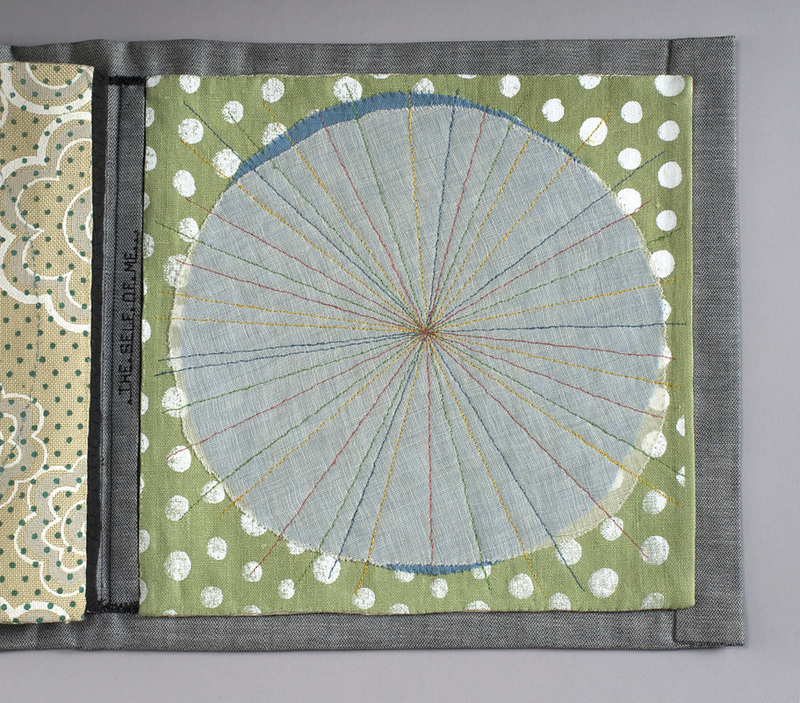 Moe Snyder made the clam shell portfolios. 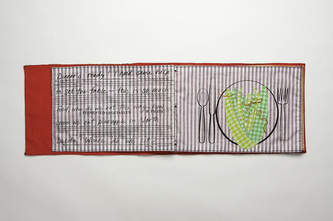 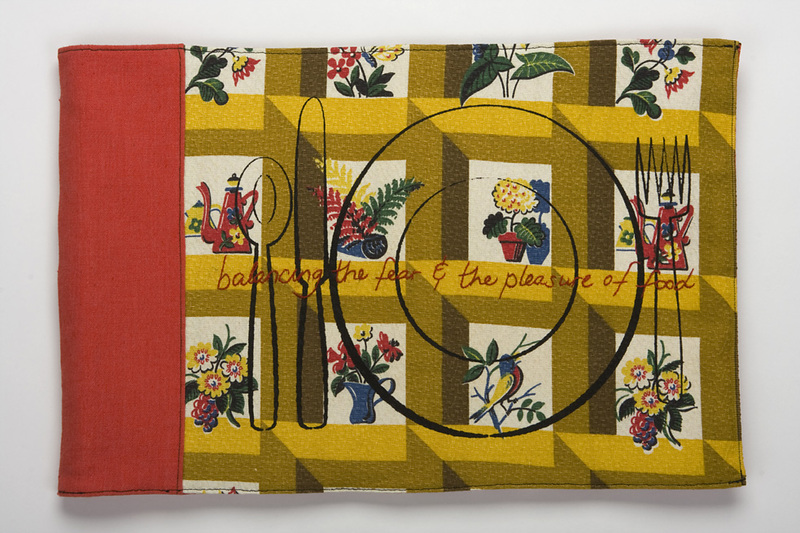 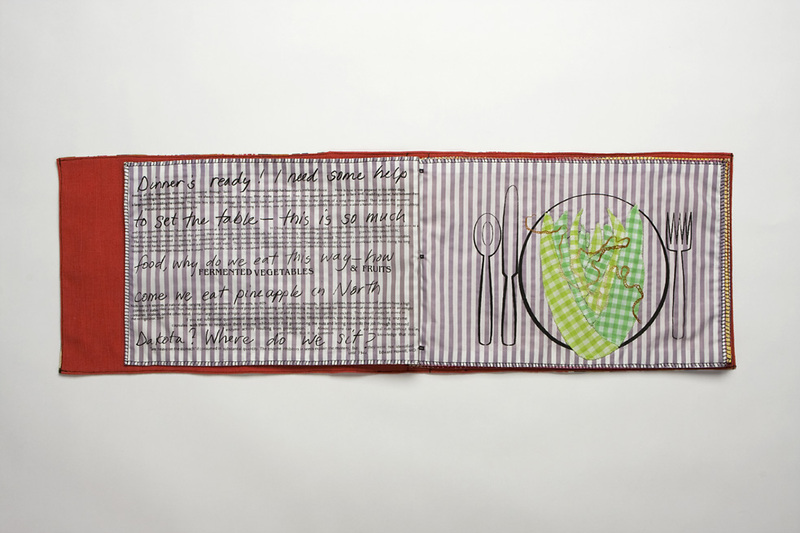 The Fear and the Pleasure of Food, 2009, the text is handwritten by the artist and the quotes are from Nourishing Traditions Cookbook by Sally Fallon. 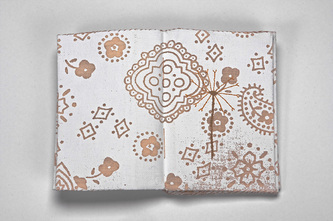 This book is made with all reclaimed materials, PrintGocco, screenprinting, and is unique. 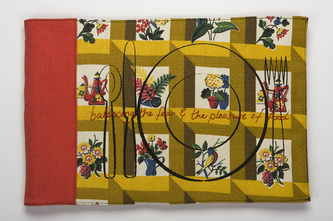 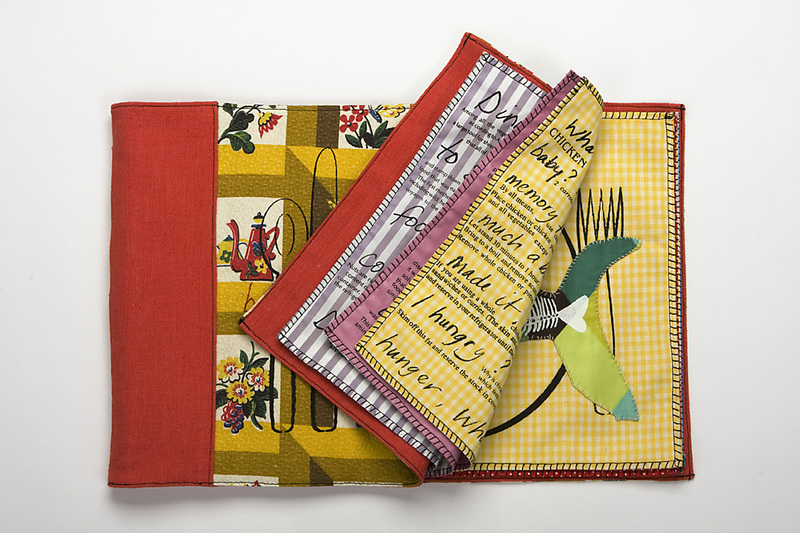 The Fear and the Pleasure of Food, unique book, 2009, detail. 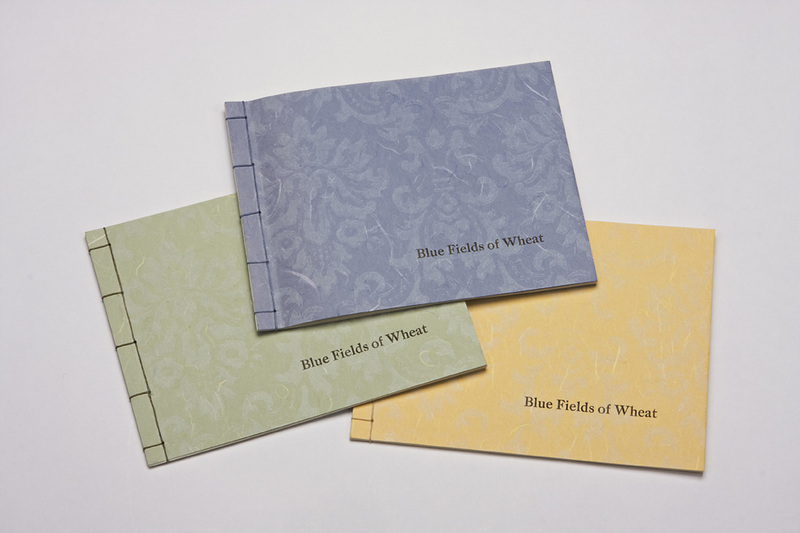 Blue Fields of Wheat: a story of transfiguration. Linoleum cuts and text by Anne Greenwood, edition of 50, 2009. 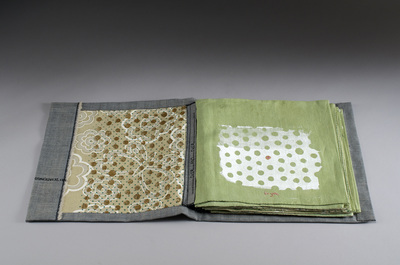 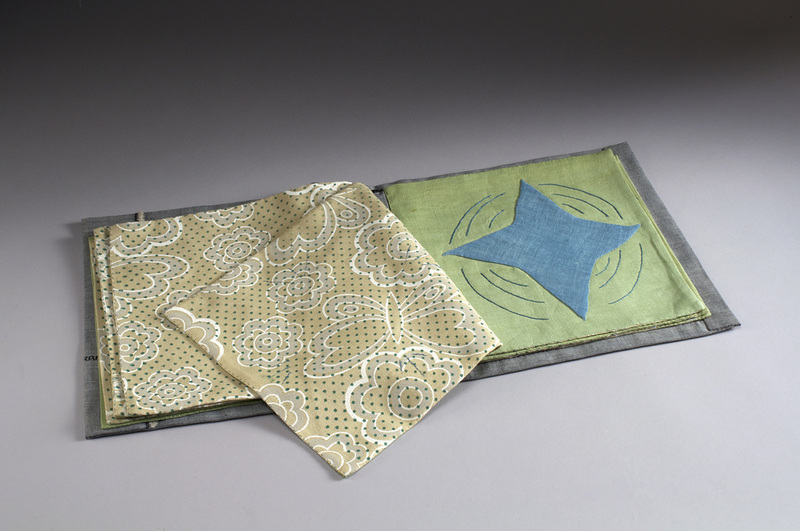 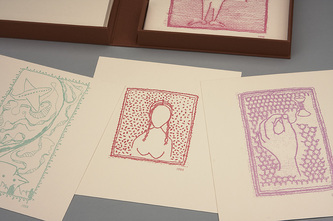 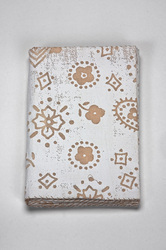 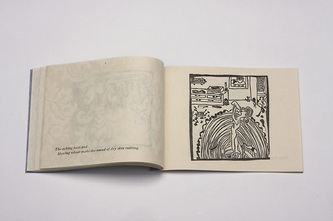 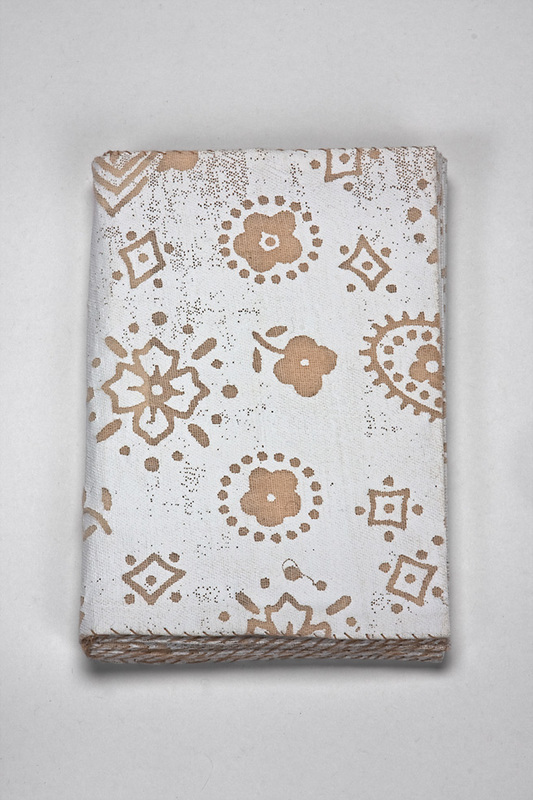 The linoleum blocks are hand carved by the artist and printed on Thai Kozo and Unryu papers. The type is hand set and printed on a Vandercook Universal III by Alisa Dix at Third Termite. Over and Over, Edition of three; 2014. 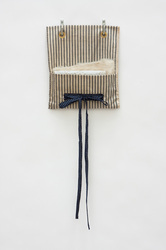 Over and Over was made during a four-year period of time. 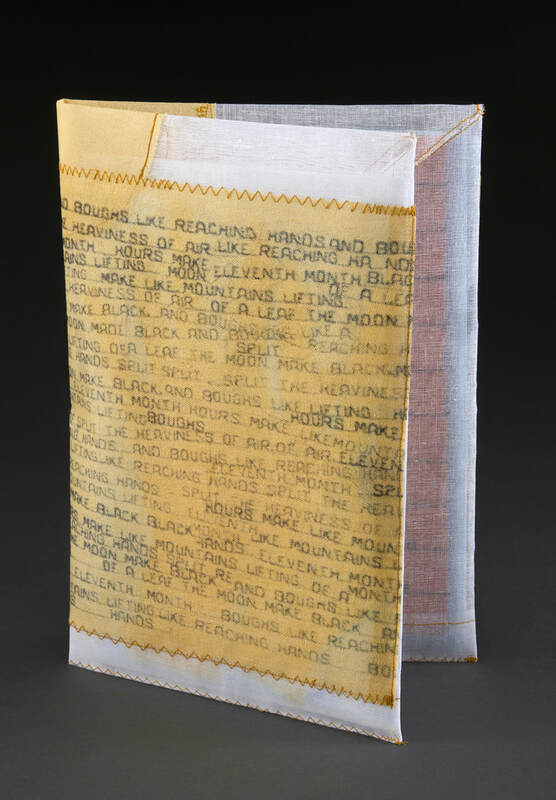 The start is marked by the passing of my good friend Kim Dodge in the spring of 2011; its end by a two-week residency at PLAYA in the remote area of Summer Lake, Oregon in November 2014. 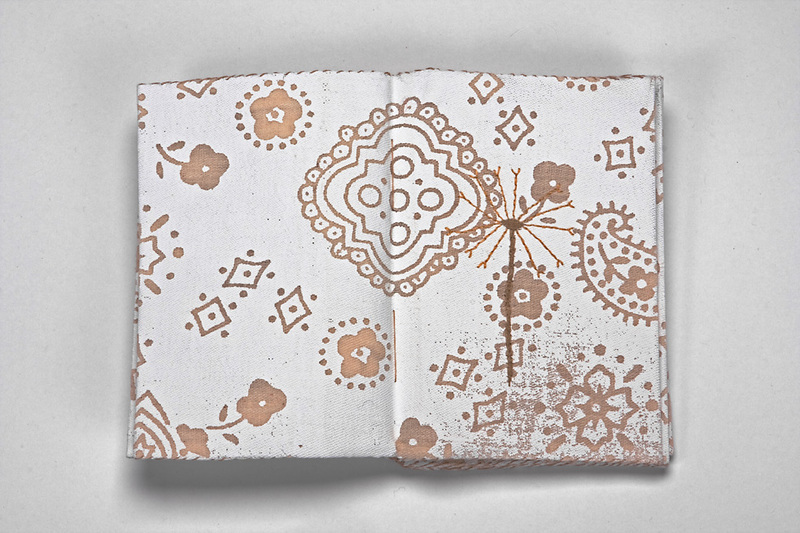 Over and Over tells the story of a process; grief, life, magic, transmutation, the in-between, what happens in a chrysalis. 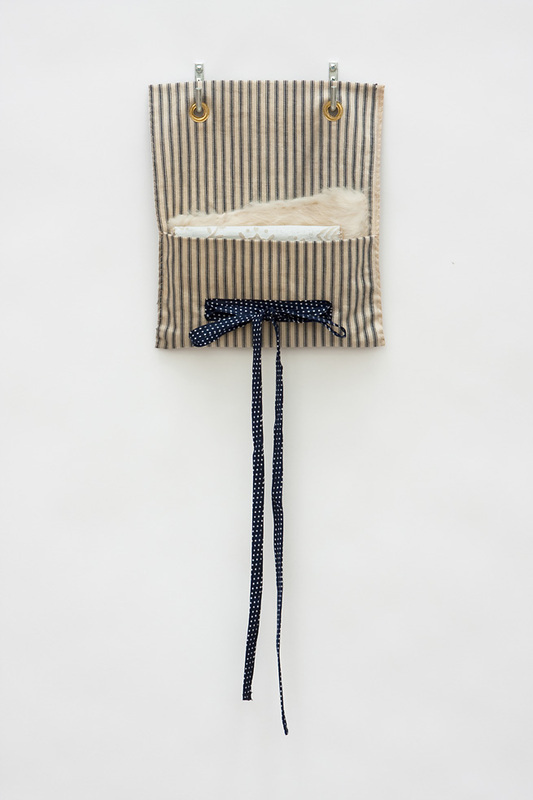 The materials are indigo-dyed linen, repurposed from the body of Wolfton, a 35’ stuffed figure I made for the installation ‘Into The Wild’ at KALA in Astoria, Oregon, in the summer of 2011. 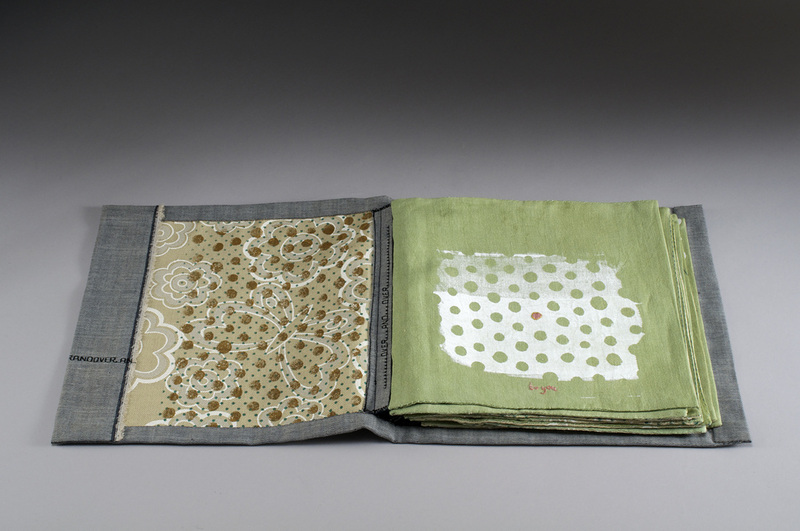 The cover and green pages were from Kim’s collection of tablecloths, the butterfly fabric came from an estate sale in North Portland. 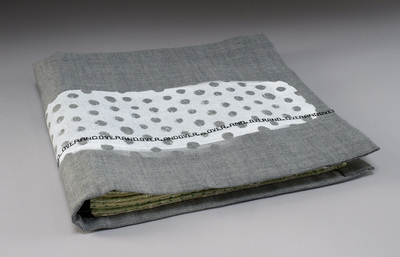 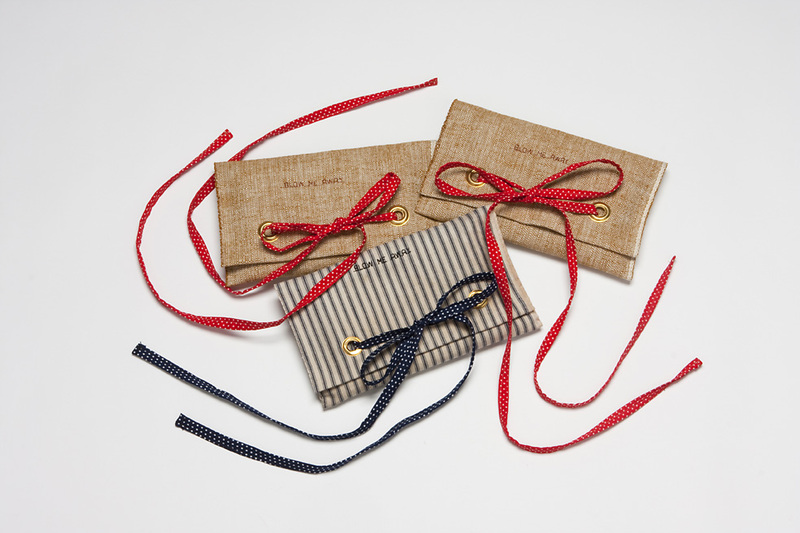 The polka dots are screen-printed and all the stitching is hand done except the cover, binding, and text along the spine.